I'm sharing a rather simple card today for someone who loves magnolias. It doesn't need much explanation! 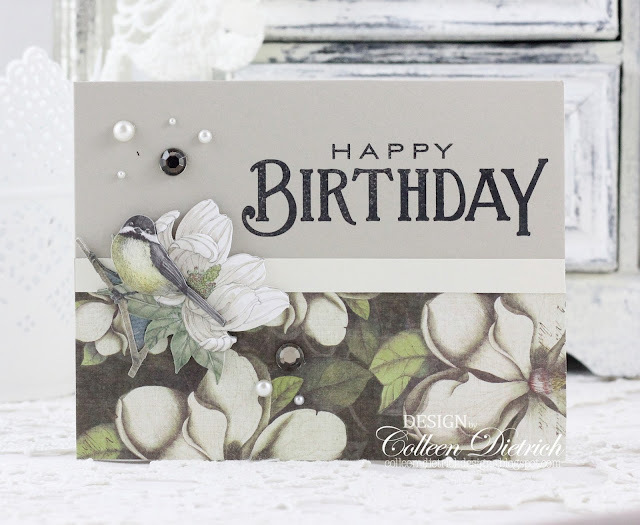 A large sentiment (Papertrey Ink) paired with magnolia-patterned paper and a magnolia/finch sticker from K & Co., a few gems thrown in for good measure, and that's it. This was made months ago (um, August, I believe), and I can tell from the composition that I was short on time that day. :-) That's a telling sign with my cards: if they are fairly simple, I was short on time or short on brain cells (aka, exhausted), guaranteed. Well it turned out absolutely stunning! Pure simple elegance! What pretty magnolia paper Colleen, this is a lovely lovely card!! What a lovely combination of elements! Simple as it is it lacks for nothing. Beautiful!